I gather you’re a latecomer to professional cycling. How did you get your start as a cyclist? The condensed version of the story is that I got into it through a journalism assignment in 2006 with ESPN on a quest to see whether or not I could get to the Olympics in two years. That was documented as a book called As Good As Gold. That’s how I found my way into road cycling. My first road race was in 2007. I was a professional triathlete at the time, so I wasn’t a total hack. What compelled you to keep going with cycling? I found some success with it in terms of my growth with the sport. I was able to progress quite quickly from Cat 4 up to the Cat 1 level. I think it was within 9 months. Then I was so smitten that I wanted to see if I could make it in the sport as a personal goal. No longer a journalism assignment, but on my own merit and my own drive. That is really what spurred me to keep going at that point. I was working with espnW which is a branch of espn and I was still racing and competing at the time. I helped Colavita merge with espnW in 2012. I was actually going to sign with another team, but I ended up with Colavita-espnW that year, which was my first pro season. What inspired you to start fighting for equality between the men’s and women’s pelotons? I really got an eye opening view of the sport of cycling when I came over from triathlon where everything is pretty egalitarian and equal in terms of prize purses. Men and women start together and compete on the same day at the same time. And it’s not just triathlon. Every sport I’ve been involved in has always been equally open to men and women. When I got to cycling I saw that was not the case at all. Women didn’t have the same race opportunities. I’m talking at the professional level. In the very highest level of the sport, women’s opportunities didn’t even come close to matching up with the men. Then I really got an interesting look at the structure and saw that the governing body didn’t really care about women’s cycling. They weren’t seeing the opportunity for either investment or progress and change on a social level. All those things came together and I started thinking, “somebody should really open the door to this topic and there should be a film so we can hear these women and see their faces.” After thinking about that for a while, I thought maybe I’m the person to tell this story. I’m in this world as a cyclist and a journalist. I believe these women trust me with their voice, our voice. That started to spur the movement towards making this happen. Tell me about making Half The Road. Did you have any filmmaking experience before hand? I have a lot of experience in terms of writing and story telling and the narrative arc that any successful article or book or anything in that regard really needs. But I’d never worked with film or a visual medium like documentary. All I knew was I had to tell the story the right way. I had to find somebody who could help me with the visual aspect who I could put my trust in. That’s really what ended up happening. I found a cameraman in search of a new project. He and I teamed up to make the film. It was two years of relentless, nonstop hard work and I think it paid off in terms of what we tried to achieve. How do you feel about the reaction to it so far? So far I’m thrilled with the reaction. I basically just have social media to go on for reaction. But I also have local people who’ve come up to me in Tucson where I live or people at bike races that’ll come up who’ll say, “I saw Half The Road and here’s how I feel about it.” It seems to evoke passion in people. The audience members that have come up to me have been rightfully angered by the situation of inequity, but also inspired by the drive and passion of the female cyclists. That’s what we were going for and it makes me really happy that the takeaway is, “wow what a crappy situation and history in terms of what the women have to go through, but it’s great that we’re starting to change that and hopefully we’re getting the right people on board to make these changes.” It comes away with an inspirational message and that makes me happy. And it makes me even happier that I will sometimes get approached by people who have nothing to do with cycling. Maybe they were a spouse or friend of someone who really wanted to see the film, but they had no vested interest in cycling. And they actually will say, “wow I really enjoyed the movie. I found it enlightening or entertaining.” That makes me feel like we did the right thing with the film by making it not just about cycling, but something much bigger, equality and progress. Have you gotten any feed back from the powers that be at USA Cycling or the UCI? I don’t hear much from USAC at all. I don’t go after USAC that much in the film. It’s more about the UCI. I would like to hear more feedback from the USAC side or at least generate the discussion about what we can do here at home. With the UCI, we really exposed [UCI President Brian] Cookson’s beliefs and thoughts and that’s a good thing. He wasn’t too pleased with some of the feedback he received, but at the same time he’s talking about it, which is good. We wanted to hold up a mirror to his thoughts and actions and words. Hopefully he hears how he sounds or how he comes across and can incorporate change into his leadership when it comes to those beliefs that are a little too outdated or archaic. Maybe there’s some good that will come of the negativity. 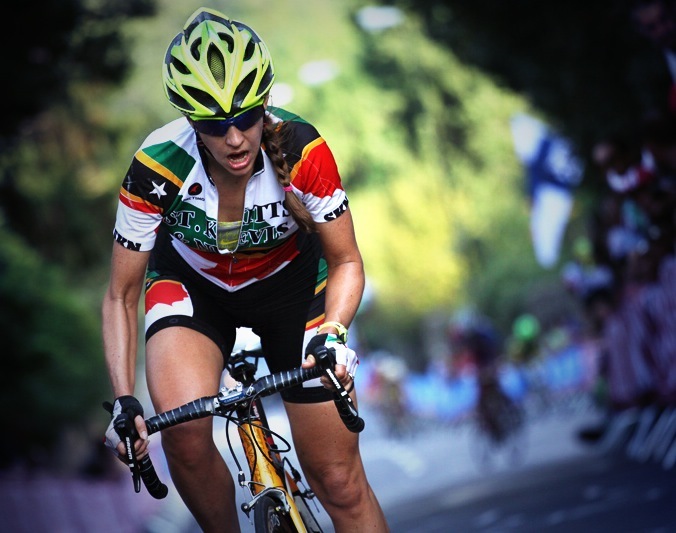 Kathryn Bertine racing with the St. Kitts and Nevis national team. The country granted her dual citizenship so she could attempt to get to the Olympics. There certainly haven’t been any grand changes in the UCI, but it seems like there’ve been baby steps in the right direction. La Course is an example, though there’s still clearly a chasm between that and a full women’s Tour de France. It’s funny because every time I hear Cookson talk about La Course he’s saying, “that happened during my time in office.” The reality is that it happened because of us. Because of women in the sport pushing for it. In the end the UCI stamped their approval and calendar identification to the race. I’m all too happy to have the UCI coming on board. We also have to acknowledge that the change wasn’t because of ASO or UCI coming up with the idea and lobbying for it to happen. It was because a group of women had to go out and gain support from a petition in order to spark the idea as even valid. It shouldn’t take the racers having to put so much time and energy and thought into how to revamp the sport. We need the people at the top to take the initiative and start thinking fresh and thinking logically about how change and growth can happen. Yes it’s great to see what has happened this year, but let’s pay attention to who’s making it happen. In general, do you feel like progress is being made? In that vein, what needs to happen to reach gender parity? I would love to see an actual position both within UCI and USAC that’s titled exactly that. Committee or Chair for Improvement of Gender Parity. It would be that person’s or committee’s job to spearhead these issues. We need somebody to be the focal point of making these things happen. A lot of it is just no brainer stuff. When we see stuff like the Tour of Colorado pumping $130 million into the economy, why isn’t anyone questioning how much more could be pumped into the economy if a women’s field were included too? I’m just beside myself that nobody’s looking at the bigger picture right now of how including women is a lucrative business investment as well as a socially moral principal. Those are the kinds of things I want to see. 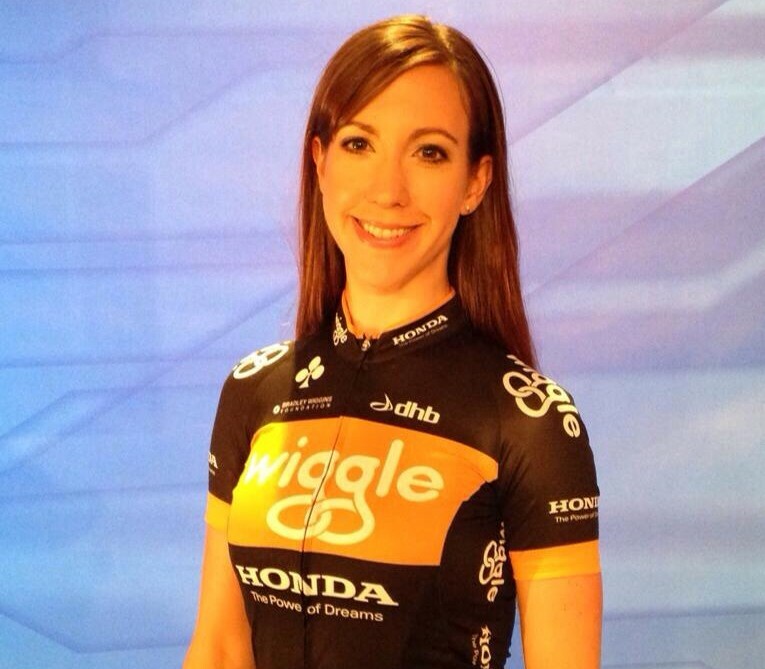 At the UCI level there is a women’s athlete commission, but many of those athletes are asked to be on it voluntarily. It’s not actually a paid position. Let’s get serious about it and make it an actual job and maybe that will help add to it as well. We’ve obviously focused on the upper echelons of the sport. What are your thoughts about the amateur level and the development level? Are there equal opportunities for women and girls or is it also a problem? I think it goes all they way. Every sector of cycling from beginning ranks to pro ranks each have issues. In junior racing or women’s racing at the lower levels they have different distances. I forget if the youngest class is 8 and under or 10 and under, but even at those ages there’s a discrepancy between the distance boys ride and girls ride. We’re effectively teaching these kids that girls are not capable of doing full distances. That stuff can and should be rectified immediately. Women should have the opportunity to race the same distances as the men. I’m not saying we have to race as far and long. But we’ve been told that we can’t because of our physiology and we need to fix that and move it to equality. Maybe shorten the men’s distances so they’re equal to the women’s. Either one. Overall, I believe that change comes from the top down. Unless you have the powers that be supporting all the elements of change that need to happen, it’s really going to be an uphill battle. We need someone in power who says “absolutely women should be equal and girls should be able to ride the same distances as little boys.” Yes Cookson has made some changes, but right now I think we’re just too old school all the way around. So you have the documentary and it seems like it’s been really successful. What’s next for you? Are you still racing? Plans for more work around the documentary? I’m in that lovely period of waiting to see if I’ll be with the team for next year. I’m in a chasm of not knowing exactly what’s next for the 2015 calendar. I’m following a few leads so we’ll see what comes up. In terms of the creative realm I would very much like to write a book about the last two or three years of this activism and what it means on a larger scale. What it really took behind the scenes and why we need to do more of it as a culture. 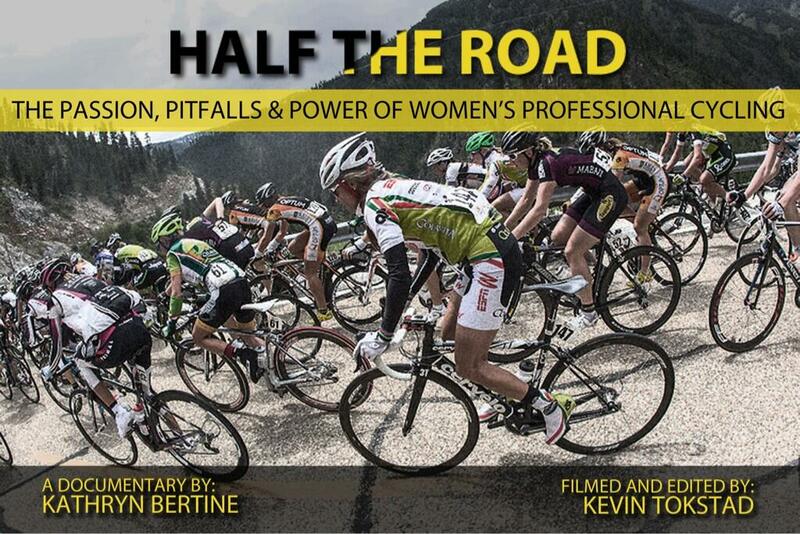 This entry was posted in Cycling Media, Interviews, Racing and tagged cycling documentary, gender gap in cycling, gender parity, giro rosa, half the road, kathryn bertine, la course, women and cycling, women's tour of britain, womens professional cycling. Bookmark the permalink.